George Hall is an unobtrusive man. A little distant, perhaps, a little cautious, not quite at ease with the emotional demands of fatherhood or of manly bonhomie. “The secret of contentment, George felt, lay in ignoring many things completely.” Some things in life can’t be ignored, however: his tempestuous daughter Katie’s deeply inappropriate boyfriend Ray, for instance, or the sudden appearance of a red circular rash on his hip. At 57, George is settling down to a comfortable retirement, building a shed in his garden and enjoying the freedom to be alone when he wants. But then he runs into a spot of bother. That red circular rash on his hip: George convinces himself it’s skin cancer. And the deeply inappropriate Ray? Katie announces he will become her second husband. The planning for these frowned-upon nuptials proves a great inconvenience to George’s wife, Jean, who is carrying on a late-life affair with her husband’s ex-colleague. The Halls do not approve of Ray, for vague reasons summed up by their son Jamie’s observation that Ray has “strangler’s hands.” Jamie himself has his own problems — his tidy and pleasant life comes apart when he fails to invite his lover, Tony, to Katie’s wedding. And Katie, a woman whose ferocious temper once led to the maiming of a carjacker, can’t decide if she loves Ray, or loves the wonderful way he has with her son Jacob. Unnoticed in the uproar, George quietly begins to go mad. The way these damaged people fall apart — and come together — as a family is the true subject of Haddon’s hilarious and disturbing portrait of a dignified man trying to go insane politely. 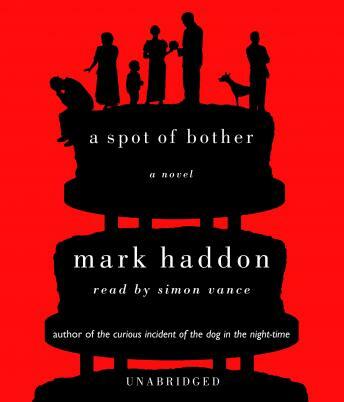 A Spot of Bother is Mark Haddon’s unforgettable follow-up to the internationally beloved bestseller The Curious Incident of the Dog in the Night-time. Once again, Haddon proves a master of a story at once hilarious, poignant, dark, and profoundly human. Here the madness — literally — of family life proves rich comic fodder for Haddon’s crackling prose and bittersweet insights into misdirected love.